When it comes to the quality of a machete, Gerber always has an upper hand on that. You’ll always find their products top notch that can be used and abused. They produce their products for real life. One of their finest product is the gator machete. 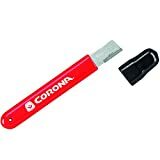 In this Gerber Gator machete review, we’ll try to explore the quality of this popular tool, where does this tool fit perfectly and also the shortcomings that this machete has (if any!). If you are an outdoor enthusiast, then you must have felt the need for an awesome tool that can pave the way for you when you are wandering around the jungle. This Gerber Gator machete is a tool that can assist you in those situations. The uniquely designed machete is a multitasker in your day to day life. So, let’s start digging the ins and outs of the gator machete. Let’s discuss the machete in details. We’ll separate the Gator machete in its part and know about them accordingly. The blade of the Gator is made by high carbon stainless steel. That ensures the durability and performance of the blade. You can see a beautiful combination of a two-sided edge on this machete like SOG kukri. On one side, there is a 15-inch fine-edge blade that is a supreme chopping machine. And, on the other side, you can see an 18-inch saw blade that is just awesome. This saw back is a high-performance addition to the blade that just adds up the value to another level. The blade is forged from previously mentioned high carbon stainless steel. So, it can withstand a lot up beating for a long period before turning dull. The tough blade is oxide-coated which gives it a dashing look. 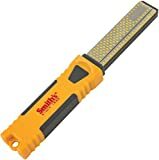 The serrated saw back is sharp and provides a lot for cutting bushes and tall grasses with maximum ease. The blade can hold an edge for a longer period of time. Once sharpened by a quality sharpener, it can go for beating the bushes. You will certainly enjoy using the blade once you get used to it. The next part is the handle. The overall length of the machete is 25.7”. That makes the handle length 7.7-inch. It is made from rubber that gives the user a sure holding of the grip. It doesn’t slip away from your hand while you are beating the underbrush and trailblazing. Also, the handle is over molded for extra performance. No matter what the application may be, this grip would provide you with unwavering confidence and secure grip. Because it was designed with that sole purpose. Besides, the rubberized texture will offer you a comfortable and stable feel in your hand in both wet and dry conditions. Now it’s the turn for the sheath. The sheath is always an important part of a machete as sheaths keep the machete protected and intact for a long time. Also, it facilitates the user with the ease of carrying the tool from one place to another. So having a good quality sheath is equally important for any tool. The sheath that comes with the machete is quite good, I would say. Not top class, but with that low price, it’s just okay for me. Besides, you can always make your own sheath with a little effort. You can read our article on making your custom-made sheath to have a go for you. The sheath is nylon made and fits quite good in it. It is riveted at the peripheral part of the sheath. The nylon sheath will provide your easy transport when you are wandering in the jungle or hiking with your bug out bag. The drawing of the sheath is quite comfortable. The nylon quality of the sheath is good as it is made by black 400-denier heavy nylon. There is a lanyard hole for you, so using a lanyard cord is advised to ensure your safety. So, what makes it so awesome? This machete is made for uses in the wilderness as well as in your backyard. Because of its unique design, it serves as a dual purpose machete. The regular edged part can help you in chopping branches and sticks while the serrated part is perfect for cutting off tall grasses and thick brushes. It is a perfect weapon for beating the underbrushes and trailblazing. As the handle is ergonomically designed, it offers a stronghold of the grip. For that reason, you get clear foliage in any single swipe. A gator is a great tool if you want to clean any shooting lanes. 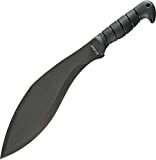 Quality and performance are optimized for this budget-friendly machete for mass people. 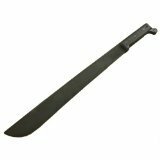 The black oxide-coated blade is cool looking and can be one of the aesthetically top quality machetes. It has so many uses and advantages that it ranks high among many choices. But, it has some cons too. It can’t chop thick branches of trees like other heavy type machetes. If you try to do that, the edge will bend and you will lose the sharpness. Some has found it very light, which it is, but has its own advantages. Overall, it’s a decent buy with that low price. I would suggest using the machete in regular light works which don’t require heavy chopping or cutting. Bearing that in mind, you are good to go. For survival purposes, you can also check the Bear Grylls Parang machete if you like. Now, what are the frequent questions that many of you are asking? Can the kids have this machete? Answer: Yes, they can. Just make sure they are aware of the safety procedures of using a machete. In fact, there is a kid version (Gerber machete jr) of this machete named the Gator Jr! Will this Gator help in a zombie apocalypse? Answer: Depends on how you can swing this into their brains! Answer: No, the machete isn’t full tang. 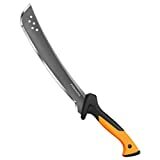 After reading this Gerber clear path machete review, if you take a look at the machete from a neutral point of view, you’ll agree that it is worthy of its price. Of course, it’s not the super performing (like kukris) heavy kind of tool. But, at this low price, it’s a bargain buy. So, have it with you and enjoy the wilderness. The Gerber Machete Gator is the real deal in your jungle journey!